If you are looking for an easy to use, easy to store, and lightweight tool for cleaning hard floor surfaces, then the Bissell Steam Mop is the product for you. This little steam cleaner has many fantastic features and comes in two different models depending on your floor cleaning needs. BISSELL 1867A Steam Mop¿ Hard Floor Cleaner for an all natural chemical-free clean. Steam Mop has quick release cord wrap with slim, lightweight design. 100% Chemical-free product with steam on demand. 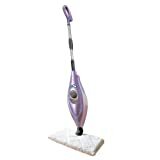 Steam Mop deluxe hard floor cleaner. Featuring water purification system. Great for spotless cleaning. One advantage of the Bissell Steam Mop and Bissell Steam Mop Deluxe is that they use only 100% steam for cleaning and there are no chemicals or fumes to worry about. Not only is this chemical free cleaning tool good for your floors, but it is also good for the environment and your health. Steam is one of the most effective ways to kill bacteria and germs that might linger after being cleaned with other cleaning agents. Another great feature of the Bissell Steam Mop series is that you only get steam when you want it. There is a trigger on the upper handle that you push when you want steam to come out of the machine. That means that you can control how much steam you use and you will not be left with wet and messy floors when you are done cleaning the way you are with continuous steam cleaners. In addition, when you plug the machine in, you will have access to the powerful cleaning abilities of the steam in just thirty seconds. Some of the larger machines take much longer to heat up and are not ready to use so quickly. 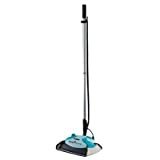 The Bissell Steam Mops come with head that swivels three hundred sixty degrees so that you can reach into hard to reach places more easily. The unit is lightweight, weighing only about nine pounds so it is easy to push around as well as move around for storage. Moving the steam mop from place to place is made easier by a carrying handle in the middle of the machine. The small water tank is removable which makes filling the Bissell Steam Mop very easy. You just pop out the water tank and take it to the sink for filling. Then you can fit it back into the machines and be on your way in less than a minute. Some of the larger steam cleaners for tile and grout cleaning have large reservoirs that you need to fill with buckets and funnels. This process can be messy and time consuming. Perhaps the best feature of this steam mop is that the mop pads are washable and reusable. 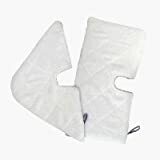 Instead of disposable mop pads that you need to throw away after one use, each Bissell Steam Mop comes with two mop pads that can be washed in the washing machine and dried for reuse. 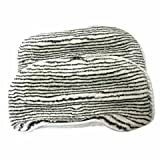 The microfiber pads are especially good at collecting dirt and allow the steam to flow freely because of their porous nature. The Bissell Steam Mop Deluxe comes with a carpet refresher attachment that allows you to use the steam cleaner to freshen carpets as well as clean hard floor surfaces. The carpet refresher attachment goes on the bottom of the machine after you attach the mop pad and allows the machine to glide easily over carpeted surfaces.